Grower Mike Sauer of Red Willow Vineyard always says that, historically, bud break would occur right around tax time. 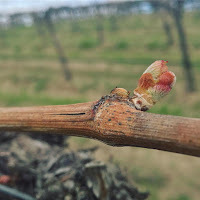 If so, this would equate to a fairly 'normal' start to the 2019 growing season compared to historical averages, certainly compared to the very early starts of recent years like 2015 and 2016, when bud break began in mid to late March. Let the 2019 growing season begin!